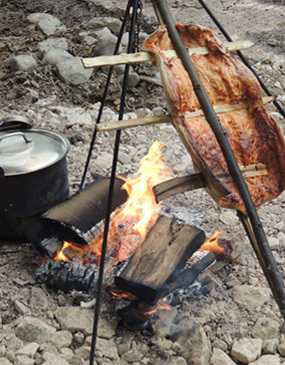 Cookery in any form is a great skill to master and even more so in a woodland over an open fire. Join the Tamarack Team in this epic culinary journey where you will learn many skills, recipes and hints & tips to make that camping experience even more enjoyable. After meeting at Tamarack Outdoors, we will load our vehicles and equipment and drive 30 minutes to the woodland. From here we will walk 500m from the vehicles into the wood and pitch camp. This will be our base for the duration of the course. After camp orientation and introductions, we will have some hearty soup and chat around the fire. The course starts proper on the Friday and will end around 16:00 on the Sunday. We will then break camp and head back to Tamarack Outdoors if we need to. Meet at 18:30 on the Thursday, the course finishes at around 16:00 on the Sunday. Price includes all food, cooking equipment and utensils. There is a minimum age limit of 16 for this course. Anyone under the age of 18 must be accompanied by a parent or guardian. NOTE: All game is pre-dispatched before preparation. Where possible all food used is locally sourced from Lancashire. Meet at Tamarack Outdoors at 18:30 on the Thursday, the course will finish at 16:00 on the Sunday. Our site is at 300 meters elevation and you will be working in the shade of the trees, because of this it can feel cool/cold even in the summer months. So please dress warmly, but have the option to layer down if we have fair weather and the woodland is warm. The site is in the North West of England, it often rains. Always use the layering system that is normally used in mountain areas. Long trousers to be worn at all times, no shorts. There are Ticks on site (as with most such areas over the country) and many activities on the course involve kneeling, sitting and walking through brash. You will be fully briefed on arrival regarding best practise to avoid ticks but long trousers will greatly reduce Tick issues. The food you bring can be anything from fresh meat, vegetables, fruit, wet or dry packet food. Pay particular attention on how you carry, store and preserve your food when packing, travelling and staying on site. A small coolbox is good for this. To help you organise and keep kit manageable on route to the site we recommend you use a rucksack or large holdall for the bulk of your equipment. Q: When I arrive at Tamarack, what happens to my vehicle ? If you have a 4x4 this is an advantage to get within 500 meters of the site. If not, there will be some car sharing to get to site and change over of equipment into other vehicles. If a non 4x4 needs to go to site, the vehicle will be parked in the nearby farmyard which is secure. Some vehicles will remain at Tamarack and parked adjacent to the shop, where there is CCTV in operation and the estate is locked at night. You need to be of fair fitness, the hardest part of the course is the walk to and from the vehicles. You will need a stove (gas, woodgas or ethanol) and cooking pots (this is not essential, but is advisable if you want to fully wild camp and cook for yourself). Tent, tarp or similar shelter. Sleeping mat and sleeping bag. Waterproof and warm clothing, hat, gloves, scarf along with walking boots or similar. Toiletries including wash kit, toilet roll and towel. Head torch, note book, pencil, foam pad to sit on, mosquito repellant. Camera and binoculars (not essential but useful). Spare clothing to change into once you get back to the car on the Sunday afternoon. Our site is at 300m above sea level and is in a shaded part of the woodland, because of this it can get cool even in the summer months, so please dress warm. All this must fit inside a rucksack or grip, remember you will have to carry all your equipment into the woodland. Q: What meals are provided ? Soup and bread will be available on Thursday night, then all meals are provided as part of the course, until close of play on Sunday. Students are welcome to bring their own food if preferred. Q: I am Vegan/ Vegetarian is this course for me ? With prior notice we can accommodate for the Vegan/Vegetarian diet but the course itinerary and food stays the same. Don't worry about this, the course goes ahead whatever the weather - unless high winds are forecast. Q: I can't make the Friday, but can I come on the Saturday ? Sorry, full attendance of the course is necessary, even if you have been on another course previously. No problem with this as long it does not effect the flow of the course. All Tamarack staff are trained and qualified in first aid, with a full comprehensive first aid kit on site. If a student needs to go to hospital, this is a 25 minute drive from site. Risk assessments and emergency procedures are in place for any eventuality.